Here I am again with another beauty from my untried polishes!! Why do I do this?!! Do any of you do the same? I hope I’m not the only one with beauties sitting untried. During the summer I saw a gorgeous swatch of this polish and I just had to have it. Of course it’s blue! Also my very first Pahlish!! Your bright shadow is a gorgeous periwinkle crème with square and round glitter and micro shimmer with purple hues. Extremely pretty!! The formula is very very nice; the glitters don’t overpower it which makes for a nice and smooth application. I’m very happy with it! Here is a pic of two coat plus top coat. 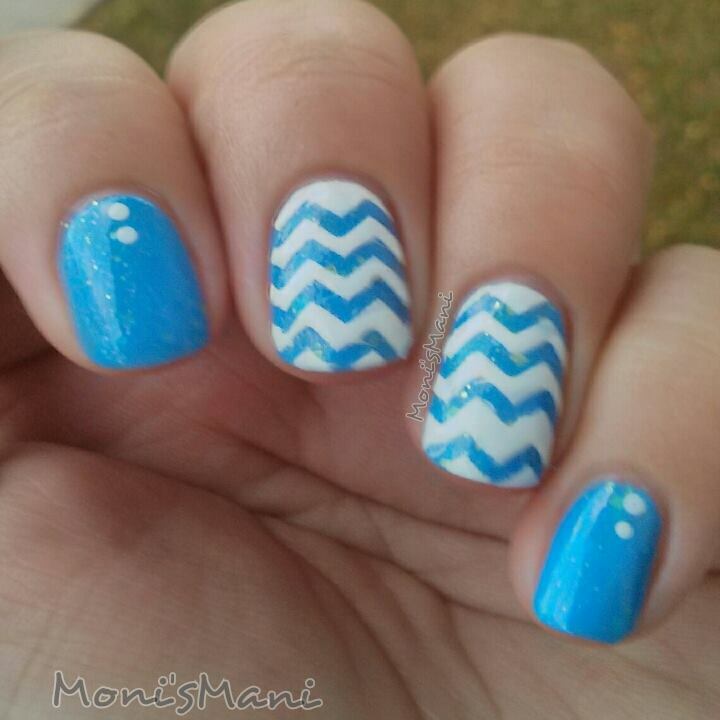 And here it is with a little nail art, I LOVE seeing all these chevron manis all over the place so I decided to do one of my own.. this is my second chevron mani ever! hope you like it! Thank you so much for reading!!! !